Our attempt to turn our home into a 3-D version of the Hovey Design Tumblr page is almost complete (almost). 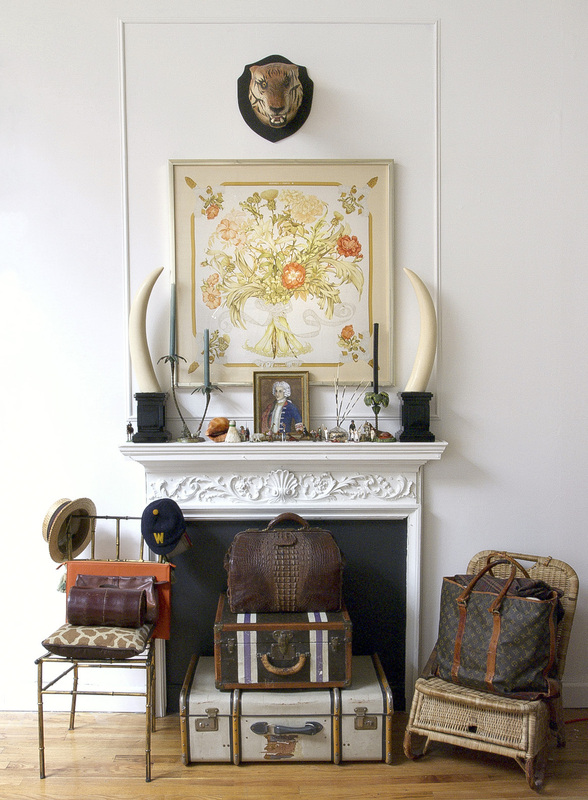 While much of the stuff is old, it looks transformed and fresh against the icy white...and a few key upgrades are fast becoming slippery slopes for new shopping urges. 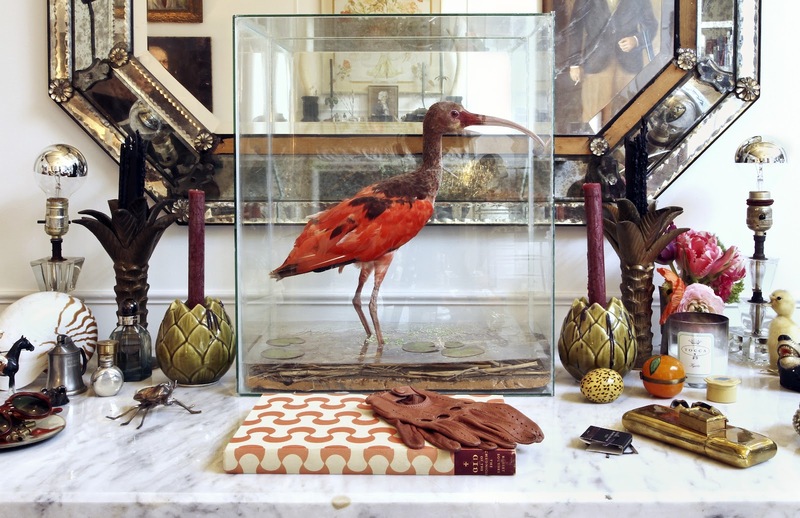 The newest and grandest find: a taxidermied scarlet ibis in a glass box. This little touch from Trinidad (via Craig's List and Rye, NY) makes the whole joint glow and sparkle like we live in some grand Parisian flat (that would definitely have herringbone floors). It's made me want to trade in all my land creatures for delicate feathery exotics. We've replaced all our Edison bulbs with those silver topped buggers and the difference is lovely since they give off a clean white light - not a golden yellow. Tragically, our beautiful Venetian mirror slipped and shattered while we were repainting, so we've hung this great 1970s framed Hermes scarf that our mom bought in Paris in its place. The tiger is papier mache from John Derian and, as mentioned previously, those tusks are made from little melted toys. Port got the tube-shaped lawn ball bag in London and I found the orange portfolio (for a relative steal) at the Bergdorf Goodman home section, the gator gladstone at the Pier Antiques show a couple years back, the Vuitton suitcase on a coffee run in SoHo and the wicker folding chair for $5 on 14th Street. Our mom used the Vuitton tote as a diaper bag when we were babies. 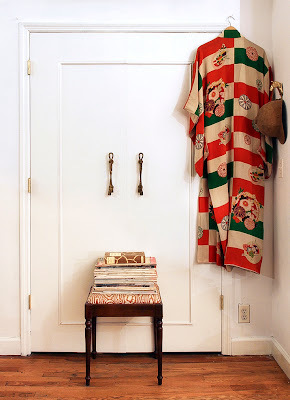 We added moulding to our horrible, hollow, cheap closet doors - and dressed them up with some great antique brass rope pulls that we found in Montclair, NJ. A wonderful friend gave me that first edition of Osa Johnson's Four Years in Paradise (with dust jacket!) for Christmas and the kimono was a vintage find that never sold at Porter's Possessions, our parents' attempt at retail in late-1970s Lincoln, NE. And for the entry, we swaddled our railings in Brooks England handlebar tape, replaced the curtain with thick Army Duck No. 10 version from Restoration Hardware and added a Chinoiserie mirror that used to live in my bedroom. I think it's the first time in 6 years that we've had a full view of ourselves before leaving the house...and the first time ever that we've been able to see our things so clearly. It's actually hard to leave! Excellent, excellent work, ladies! 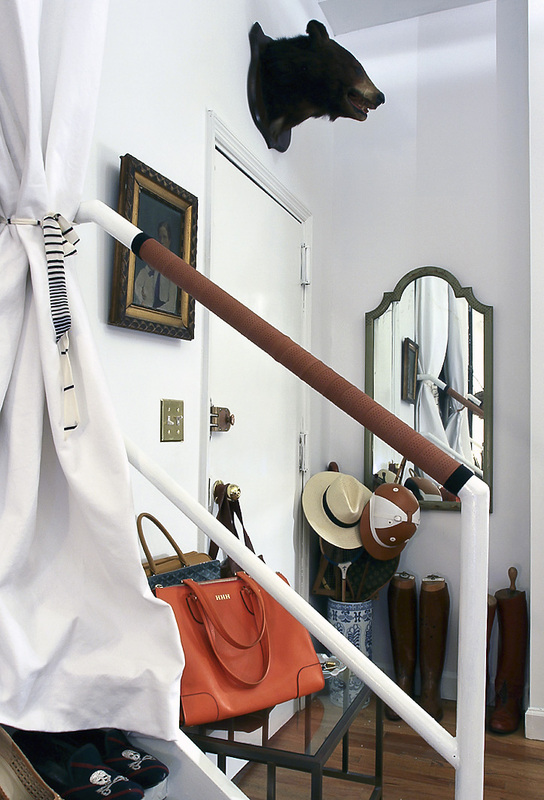 I love what you've done to the closet doors. I think a Hovey Design tutorial for hunting down treasures is in order. I wouldn't even know how to begin to find exotic birds on Craigslist. Gawping: Holy ... moly, Hollister. It's gorgeous. Cannot close mouth right now. Oh I love it all Hollister. That Ibis is so grand. The mirror was a tragedy; however the Hermes scarf is priceless. I would love an orange portfolio. Bravo! I would want to stay home as well. Oooh, I am feeling a little puffed up proud of myself at the moment! A little asky and yee shall receivey. :) Thank you for a...sigh...gorgeous, inspiring post. Great ideas! 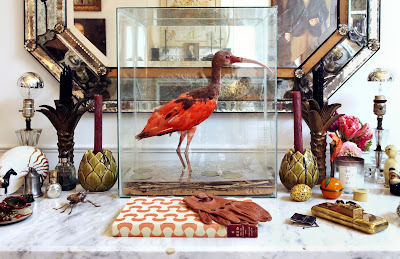 I love taxidermy and have never seen and Egret in that color. When is your book due out...so eager to see it. I love the Hermes scarf. Karen at Garden, Home and Party. As always I am amazed at your vision and your results. I am just so impressed with your editing power and the fact that you only choose things that correspond to the look you are going for. Good show. Thank you so so much. It means so much...and I wish there were scarlet ibises in all apartments! How did I go 33 years without one?! I love the closet doors. Great idea, I was thinking of trying something similar except I am stuck on the closure hardware. How do you doors stay closed?